← Action Between the Flags and Success in the Sales Ring. O’Connor treble headlines Dungarvan Point to Point. With three Point to Point meetings to chose from this weekend action in the South East was in Affane for the Dungarvan Harriers meeting. Racing on land with the permission of its owner Bob Murphy the hunt here provided a tight track and good racing ground. With an original entry of 90 there was little chance of a divide with the six race card having 48 declarations. The headline act here was MJ O’Connor who did particularly well to boot home 3 winners on the afternoon, while other winners of note were Irene Walsh, JJ Slevin and Maxine O’Sullivan. Mikey O’Connor has been an important player in the southern region for a number of years now and has a reputation as a talented horseman. This was seen to great effect on each of his three winners today with his win on Theatre Princess particularly noteworthy. This 6 year old daughter of Kings Theatre who had been tried on the track is trained by Michael Winters in Kanturk and is owned by Eamonn Tarrant from Kanturk town. Ciaran Fennessy tried to make all the running on Pops Well in this Mares Winnner of Two contest but he was strongly pressed by Theatre Princess and Eala Beag. O’Connor got to the front at the second last and withheld the late challenge of Eala Beag to win by a neck. Representing the winning connections on the day O’Connor stated “She will go for another winners race and might go for a mares hunters chase much later into the season”. Racing opened with the 4 year old maiden which saw O’Connor ride the 4 year old Generous gelding Arden Denis to a somewhat fortunate win from the hampered Derek O’Connor and Thanks In Advance. The possible outcome of this race changed totally at the last fence when Rough King and Andrew Latta tumbled at the last when in front. Having led all the way Latta and his trainer Donnachadh Doyle must have been gutted to lose it. In the process they hampered Thanks In Advance and O’Connor steered a safe passage around them to win by 4L. Speaking afterwards in the winners enclosure the winning trainer Conor Casey noted “He deserved it, his experienced stood to him here. We don’t know what to do, we will make no rash decisions” Casey who trains 9 horses in Aglish, Co Waterford bought this horse at the Derby Sale for his owner Sharon Saville and it is interesting to note that it was his sires third winner of the weekend between the flags. Michael Winters provided us with the third winner of the meeting here with Missed Cloud. He was absent here as he was at the track meeting in Cork but he has O’Connors horsemanship to thank here as the 5 year old Cloudings mare wouldn’t have won without him. This three runner race was eventful to say the least as only two of them completed with Comebackgirl running out on the first circuit and having retraced her steps fell when being hunted around for third place. O’Connor went for a stride at most fences but the mare didn’t always get the lines right as she hit more than one or two of the 16 fences facing her. They did stay intact however and stayed on to defeat Rose of Milan. O’Connor stated afterwards “She jumps well at home. We were going too slow, but she is a fair mare and could go for a bumper next”. JJ Slevin made the trip from Wexford to take the mount on Brandon Hill a successful in the 13 runner 5 year old geldings maiden. Trained by Inistioge, Co Kilkenny man John Clifford this son of Beneficial was well handled by Slevin to get past the longtime leader Buster Dan Dan. Slevin was riding his 13th winner of his career and stated afterwards “It was good to get that” on the Michael Rafter owned and bred horse. Clifford was keen to outline the plans for the horse “We were expecting that, everytime he has been ready for the sales he has been sick, so the intention is to sell rather than race”. The Open Lightweight saw Limerick based Irene Walsh win on Pocket Rocket for the second time this season and bring her career tally to six. 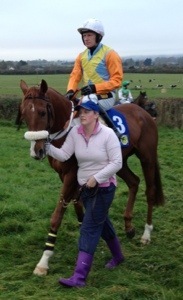 Trained in Co Cork by Eugene O’Sullivan 7 year old son of Sonus was winning his eighth point to point. A very strong pace was set by Shiela Aherne in the 5 runner field but she was stalked by Walsh all the way who ran out a 5L winner from Castlefort with the admirable Isourbell in third. The horses winning trainer stated afterwards “This is the way we will go for the season, we will try to win as many Opens as possible”. The six race card concluded here with the older horses maiden going to Pairc Na Leasa and Maxine O’Sullivan. O’Sullivan who was opening her account for the new season has now won 17 times having been joint Ladies champion a few years back. The 21 year old who works at her home base of Eugene O’Sullivans handled the 7 year old son of Beat All well and came from off the pace to beat the longtime leader Bashful Beauty by 10 lengths. The horses winning owner/trainer David Finn commented afterwards “He has had some good runs on the track. He may go back there as there is a handicap hurdle at Cork on the 8th”. One Response to O’Connor treble headlines Dungarvan Point to Point.